Sinful Folk via these links: Amazon, Indiebound, Audible. With Sinful Folk, I once again find myself thanking Mr. Rap, if only in my imagination. This historical mystery offers any and all Brit. Lit. students many a nod to well-known medieval works, and schools us in some particularly dark and dire customs and events of fourteenth century England as well. 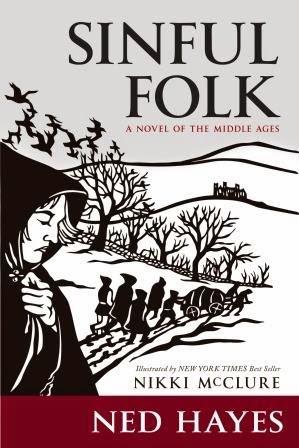 It’s also a novel of pilgrimage, and Nick Hayes borrows directly from Chaucer (and other period writers), especially toward the close of the book. Our narrator and protagonist is Mear – once Miriam – a mute “man” living with his” ten year old son in the English village of Duns. When Christian and four other boys are killed in a house fire during a particularly bleak mid-winter, Mear and the other fathers set off with the boys’ bodies for Canterbury and London to seek court assistance in determining who has killed them. On the journey, we learn something of the men’s histories and experience the violent, often superstitious forces that appear to dominate popular culture in this time. And we – with Mear – unearth clues as to who indeed killed the unfortunate young men. Sinful Folk is based on a real mystery and Miriam’s personal history loosely parallels that of some consorts to Prince Edward the Black as well. Fans of historical fiction should absolutely pick this one up, as it is reach in period detail, but the story is never overwhelmed by it, as does happen with some regularity in this genre. Miriam is a unique character as well, in my experience, and her story – albeit a mash-up of possibilities rather than a direct historical reference – fascinates. Mr. Hayes does a solid job of conjuring up the settings as well, and of keeping the plot ticking until the last page is turned. Because I had made a commitment to review it here, I persisted, and in the end I was glad that I did, because by the last quarter of the novel I was thoroughly engrossed in both the plot and the prose. It’s good to see, once again, how abundantly my home state of Washington is blessed with fine writers.